Designing for Civil Society: The price of local democracy - a bit of "street clutter"
The price of local democracy - a bit of "street clutter"
With formal democracy in such poor health, and a Government Minister calling for double devolution of power to community groups, you might expect local councils to be desperately keen to encourage active citizens to drum up interest in elections. And if a group said they would give every candidate a free web site linked to an online hustings (something I believe councils can't do), you might expect high delight in the Town Hall and collaboration all round. Not entirely so in Richmond upon Thames, however, where there is a sticking point: lamp-posts. 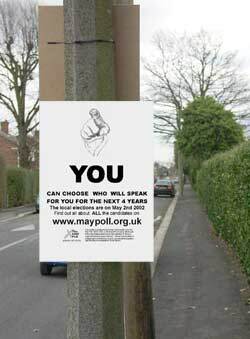 There the volunteer-run online community site Oncom , that covers the borough, offered to run a May election site in exchange for one concession: they wanted to publicise it with placards on lamp-posts to make sure local people read what the politicians had to say, and democracy was widely served. Volunteer Jill Sanders, who helps run the online community, sends me a series of email exchanges between her friend and site founder John Inglis, and the chief executive of the local authority, Gillian Norton, which are extremely courteous but quite adamant. The chief exec adds: "We have tested this view quite hard but in the end that was the conclusion of discussions. However, we are very keen that this initiative gets good coverage and would hope that the posters could be displayed in libraries and other community facilities. It may be that Doctor's surgeries and other places where people visit/gather will be able to help." This isn't good enough for Oncom. You can read the story here on Oncom, and I suggest while you are there you look around at what is a quite extraordinary example of what volunteers can achieve. Jill describes the project in more detail in egovmonitor. It is just the sort of project that first got me excited 10 years ago about the potential of the web at local level. Sadly most online local communities haven't done as well, perhaps because it is such hard work to cover the diversity of any area and its interests. I've met Jill and John, and admire enormously the passion that they bring to their project. I gather there is, to put it mildly, a bit of history with the local authority. There may be good reasons for the lamp-post decision, but they are not evident in the e-mail exchanges. It's difficult not to feel that the local authority could be just that bit more helpful. Without that double devolution just isn't going to happen. ... and probably in a dozen other posts that I won't burden you with now.